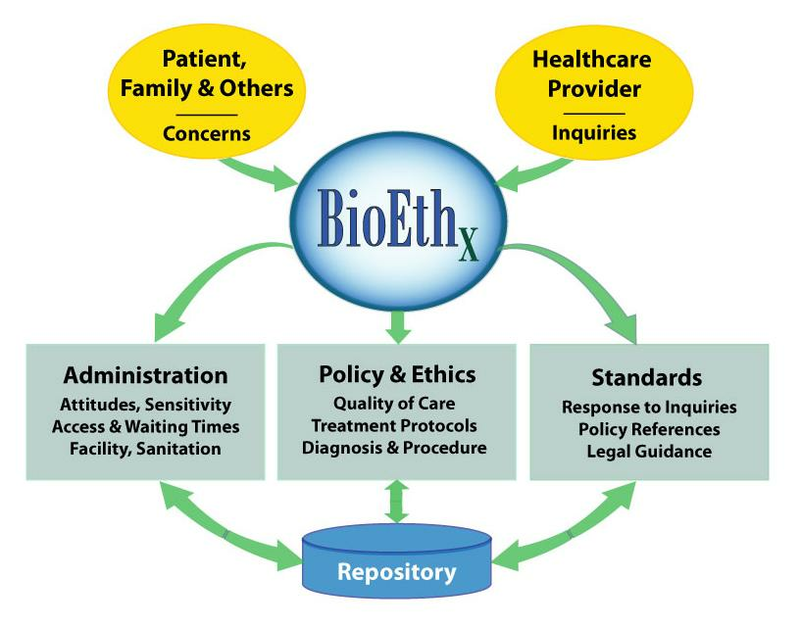 BioEthx™ has conducted research into private sector practices in documenting and managing the progression of bioethics cases in the clinical setting. BioEthx staff has long been involved in the development of software designed to assist ethicists and ethics committees in managing clinical and organizational ethics cases. Accumulated expertise and evolving software delivery methods have now come together to produce the first publicly-available software system dedicated to the task of healthcare ethics consultation. The end result is the BioEthx online service for consult management. The web-based service is designed to support the management of ethics consultations from initial event and information capture through resolution and follow-up evaluation. It provides an effective and easy-to-use tool for managing the workflow of ethics consultations in accordance with established procedures and to fully document case history and the analytical process undertaken to produce the best possible outcome. Each organization (hospital, healthcare system, clinic, etc.) is set up as a unique Facility which contains only the consult information relevant to that organization. assigned specific roles within the system depending on their area of functional responsibility; ethics consultation, consultation evaluation or system administration. Roles provide for various levels of information visibility and access to system functions. Privileges and navigational authorizations are assigned to user sessions based on their specification of a facility ID and functional role at system login. The system maintains a roster of all individuals that are qualified and eligible to become involved in ethics consultations. An administrator or ethics consultant can create a new consultation record and, as appropriate, choose one or more individuals from the roster for inclusion on the consultation team. The system can issue notifications via email or text message to ensure timely response and coordinate case management by advising consultants of referrals, reminders and planned activities. Clinical Consultations that involve provision of care to a specific patient are typically the most challenging to manage because they involve multiple internal and external stakeholders, requirements for short-term decision making regarding patient care, and sometimes-difficult moral deliberations that lead to greater complexity. The clinical consultation in BioEthx is presented as a flexible, multi-step workflow process designed to foster efficiency, accuracy and completeness in reaching the best possible outcome for patients. The system ensures that a required minimum level of input is achieved before a consultation can be closed. The system also provides a streamlined workflow process for Organizational Consultations; those less complex ethics-related situations that involve systemic issues rather than specific patient care. The system is driven through a focus on the consultation record, a substantial collection of inforamtion elements that define the complete record of a consultation from end to end. Through its presentation of screen-to-screen navigation options, the system recommends a workflow process for the orderly execution of activities that typically lead to well-managed ethics consultations with high quality outcomes. This being the case, there is also a great deal of flexibility in the system to navigate among the steps of the ethics consultation process in a more ad-hoc fashion to support real-time and/or collaborative input and participation by multiple ethics specialists. Support tools assist consultants in the management of consult information. List and Search functions facilitate easy display of the consultations authorized to the user. Other tools available include the ability to create Reminders which notify consultants of key tasks to be completed, and the ability to create and save Notes related to a consult. Of particular importance is the ability to upload documents to the server in common electronic form (e.g. .pdf, Word, Excel and image files) for later reference during the consultation process. Uploaded documents may take the form of Attachments, specific to an individual consult, which may include legal documents such as advance directives and the like. Uploaded documents may also be stored as Resources, which reside in a facility-wide repository for reference for all consultants within a facility. These might be published reference materials, and internal documents that describe policy or procedure. Consultants may utilize a tool for generation of a comprehensive ethics consultation note for inclusion into a patient's medical record. Notes are generated in Microsoft Word format. A Facility contains only the consult information related to an organizational or other logical grouping of ethics consultants. Types of consult records can be viewed and which set of system functionality can be utilized. In addition, consultants can only view and access consult records on which they have been designated as either the Primary Consultant or a Secondary Consultant. Primary Consultants designate which other consultants within a Facility are authorized to participate in a consult. The BioEthx service is hosted in an advanced-security data center in the U.S. that is HIPAA- compliant, PCI-compliant and SAS 70-certified. Multiple levels of network security for browser access to the service (HTTPS, SSL VPN, and L2L VPN) are available depending on customer Within each Facility, user Role designations govern what organization requirements. BioEthx has recently passed a HIPPA audit. The service is covered by a Business Associate Agreement.